CLARK (Clarke), ROBERT, master millwright, jp, and militia officer; b. 16 March 1744 in Quaker Hill, N.Y.; m. Isobel (Isabella) Ketchum of Long Island, N.Y., and they had five sons and one daughter; d. 17 Dec. 1823 in Ernestown Township, Upper Canada. Before the American revolution Robert Clark was a carpenter, millwright, and farmer, first in Dutchess County and then in Albany County, N. Y. 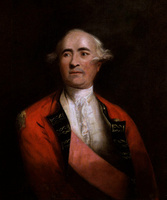 Although a member of the rebel militia for three weeks in 1776, he joined the Loyal Volunteers and saw service in Major-General John Burgoyne*’s army. After the surrender at Saratoga (Schuylerville) in October 1777, Clark escaped and, “Leaving his family Exposed to the Rage of the Enemy,” made his way to the province of Quebec. There his skill as a millwright was recognized. By 1780 he was attached to a corps of artificers under the control of the engineers. In this capacity, he worked on projects at St Johns (Saint-Jean-sur-Richelieu) and Montreal; he was last mustered with Major Edward Jessup*’s Loyal Rangers in 1783. 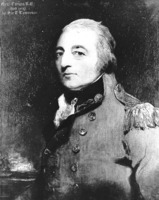 On 22 Aug. 1783 Captain William Twiss, the commanding engineer in Quebec, ordered Clark to report to Lieutenant William Tinling, who was in charge of the engineers at Cataraqui (Kingston) in western Quebec. Clark became master millwright and supervisor responsible for building the saw- and gristmills at Kingston Mills in preparation for the impending influx of loyalists [see Michael Grass*]. Good millwrights were in great demand but the commandant at Cataraqui, Major John Ross*, although satisfied with the technical aspects of Clark’s work, wished to replace him with Lieutenant David Brass of Butler’s Rangers whom he considered a “remarkable genious” and “exceeding Good Mill-wright.” Commenting to Governor Haldimand* about Clark’s administration of the project in a letter written on 10 June 1784, Ross was mildly critical: “The Saw Mill is a very good one, but an expensive Job and taken much longer time building than what Mr. Brass . . . told me was necessary. I believe the man employed on the occasion to be a very good artificer himself, but perhaps has not the influence or command over the workmen as Mr. Brass is said to have.” Whether the judgement was fair or not, Ross cited the need to reduce costs and expedite construction and sent immediately for Brass. Whatever disappointment Clark may have felt was probably mitigated by his reunion with his family in that same year. In 1782 Isobel Clark and her three sons had been driven from their farm in New York and they arrived at Quebec in the autumn of the following year. In his memoirs another, younger son recalled their plight: “They wintered at Sorel, where they all were afflicted with the small-pox, and being entirely among strangers, most of whom spoke a language not understood by them, they were compelled to endure more than the usual amount of suffering incident to the disease.” After a separation of seven years the family came together again at Cataraqui. In 1785 Clark took his wife and children to Napanee where he was again employed by the government to build saw- and gristmills, which were completed by late 1786. Although he usually worked in either Napanee or Millhaven, Clark located along the lake front of Ernestown Township near Parrotts Bay. In 1791 and 1792 he made repairs to the Napanee mill complex and provided dimensions for a new mill. In fact, he may have built Richard Cartwright*’s mill at Napanee, erected in 1792. From 1789 until his death he attempted to secure title to a lot at Millhaven and build his own grist-mill; however, he was continually frustrated by the Executive Council. Appointed a justice of the peace for the Mecklenburg District in 1788, Clark also served on the Court of Requests and was a captain in the 1st Addington Militia. He was a member of the second (Ernestown) Methodist class organized by William Losee; indeed, early Methodist meetings may have been held at his house. Moreover he was a subscriber to and the builder of the Ernestown or Parrotts Bay Chapel, on which construction began in May 1792. Clark was one of the judges at the second trial of the controversial Methodist itinerant preacher Charles Justin McCarty* on 13 July 1790; the court ordered McCarty deported, a verdict whose justice has been hotly debated by historians. The early government mills located at both ends of the Cataraqui-Bay of Quinte settlement were a boon to pioneer development. Although Major Ross and Deputy Surveyor General John Collins* have received many of the laurels for laying the foundations of the new settlements, it took men such as Robert Clark to design and construct the mills so essential to a pioneer economy. Clark also contributed to the development of a society in the fledgling loyalist community. AO, ms 768, A-1, P. M. Clark to Canniff, January 1868; MU 571; RG 22, ser.156, 1, administration book B (1821–33); RG 40, D-1, no.697. BL, Add. mss 21786: 40–41, 92–95, 104–9, 126, 142; 21815: 59; 21827: 174, 319, 326. PAC, RG 1, L3, 89: C1/45; 99: C11/107; 108: C15/80; 118: C19/139; 126: C misc., 1785–95/ 171; 184: Ernestown Mills, 1804/1–10. PRO, AO 13, bundle 80; WO 28/4: 273, 281; 28/10, pt.ii: 286, 317–18; pt.iv: 464 (mfm. at PAC). QUA, Parrot family papers, file 2, James Parrot, corr. ; file 5, legal docs. “Grants of crown lands in U.C.,” AO Report, 1929: 62. “United Empire Loyalists: enquiry into losses and services,” AO Report, 1904: 474. E. [O.] Clark Watson, Loyalist Clarks, Badgleys and allied families . . . (2 pts. in 1v., Rutland, Vt., ), pt.ii. G. F. Playter, The history of Methodism in Canada . . . (Toronto, 1862). Egerton Ryerson, The loyalists of America and their times: from 1620 to 1816 (2nd ed., 2v., Toronto and Montreal, 1880). T. W. Casey, “Napanee’s first mills and their builder,” OH, 6 (1905): 50–53. C. C. James, “The origin of Napanee,” OH, 6: 47–49. Larry Turner, “CLARK, ROBERT (1744-1823),” in Dictionary of Canadian Biography, vol. 6, University of Toronto/Université Laval, 2003–, accessed April 24, 2019, http://www.biographi.ca/en/bio/clark_robert_1744_1823_6E.html.